Sukarno[a] (/suːˈkɑːrnoʊ/; born Kusno Sosrodihardjo, Javanese: [kʊsnɔ]; 6 June 1901 – 21 June 1970) was the first President of Indonesia, serving from 1945 to 1967. After a chaotic period of parliamentary democracy, Sukarno established an autocratic system called "Guided Democracy" in 1957 that successfully ended the instability and rebellions which were threatening the survival of the diverse and fractious country. 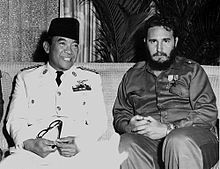 The early 1960s saw Sukarno veering Indonesia to the left by providing support and protection to the Communist Party of Indonesia (PKI) to the irritation of the military and Islamists. He also embarked on a series of aggressive foreign policies under the rubric of anti-imperialism, with aid from the Soviet Union and China. The failure of the 30 September Movement (1965) led to the destruction of the PKI and his replacement in 1967 by one of his generals, Suharto (see Transition to the New Order), and he remained under house arrest until his death. The son of a Javanese primary school teacher, an aristocrat named Raden Soekemi Sosrodihardjo, and his Hindu Balinese wife from the Brahmin varna named Ida Ayu Nyoman Rai from Buleleng regency, Sukarno was born at Jalan Pandean IV/40, Soerabaia (now known as Surabaya), East Java, in the Dutch East Indies (now Indonesia). He was originally named Kusno Sosrodihardjo. Following Javanese custom, he was renamed after surviving a childhood illness. After graduating from a native primary school in 1912, he was sent to the Europeesche Lagere School (a Dutch primary school) in Mojokerto. 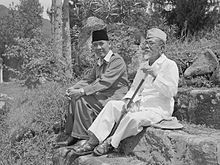 Subsequently, in 1916, Sukarno went to a Hogere Burgerschool (a Dutch type higher level secondary school) in Surabaya, where he met Tjokroaminoto, a nationalist and founder of Sarekat Islam. 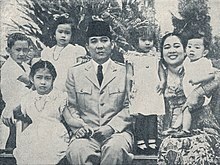 In 1920, Sukarno married Tjokroaminoto's daughter Siti Oetari. In 1921, he began to study civil engineering (with focusing on architecture) at the Technische Hoogeschool te Bandoeng (Bandoeng Institute of Technology), where he obtained an Ingenieur degree (abbreviated as "Ir. ", a Dutch type engineer's degree) in 1926. During his study in Bandung, Sukarno became romantically involved with Inggit Garnasih, the wife of Sanoesi, the owner of the boarding house where he lived as a student. Inggit was 13 years older than Sukarno. In March 1923, Sukarno divorced Siti Oetari to marry Inggit (who also divorced her husband Sanoesi). Sukarno later divorced Inggit and married Fatmawati. In his studies, Sukarno was "intensely modern", both in architecture and in politics. He despised both the traditional Javanese feudalism, which he considered "backward" and to blame for the fall of the country under Dutch occupation and exploitation, and the imperialism practised by Western countries, which he termed as "exploitation of humans by other humans" (exploitation de l'homme par l'homme). He blamed this for the deep poverty and low levels of education of Indonesian people under the Dutch. 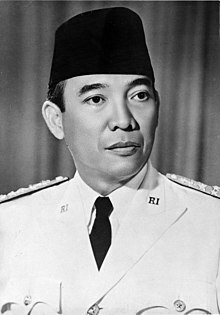 To promote nationalistic pride amongst Indonesians, Sukarno interpreted these ideas in his dress, in his urban planning for the capital (eventually Jakarta), and in his socialist politics, though he did not extend his taste for modern art to pop music; he had Koes Bersaudara imprisoned for their allegedly decadent lyrics despite his own reputation for womanising. For Sukarno, modernity was blind to race, neat and elegant in style, and anti-imperialist. Sukarno was first exposed to nationalist ideas while living under Oemar Said Tjokroaminoto. Later, while a student in Bandung, he immersed himself in European, American, Nationalist, communist, and religious political philosophy, eventually developing his own political ideology of Indonesian-style socialist self-sufficiency. He began styling his ideas as Marhaenism, named after Marhaen, an Indonesian peasant he met in southern Bandung area, who owned his little plot of land and worked on it himself, producing sufficient income to support his family. 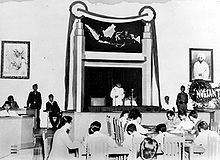 In university, Sukarno began organising a study club for Indonesian students, the Algemeene Studieclub, in opposition to the established student clubs dominated by Dutch students. Sukarno at his home in exile, Bengkulu. Sukarno, accompanied by Mohammad Hatta (right), declaring the independence of Indonesia. In the early morning of 17 August 1945, Sukarno returned to his house at Jalan Pegangsaan Timur No. 56, where he was joined by Mohammad Hatta. Throughout the morning, impromptu leaflets printed by PETA and youth elements informed the population of the impending proclamation. Finally, at 10 am, Sukarno and Hatta stepped to the front porch, where Sukarno declared the independence of the Republic of Indonesia in front of a crowd of 500 people. This most historic of buildings had, however, been ordered to be demolished by Sukarno himself, without any apparent reason. Establishing a Central Indonesian National Committee (Komite Nasional Indonesia Poesat/KNIP) to assist the president prior to election of a parliament. With the backing of the military, Sukarno disbanded the Islamic party Masyumi and Sutan Sjahrir's party PSI, accusing them of involvement with PRRI-Permesta affair. The military arrested and imprisoned many of Sukarno's political opponents, from socialist Sjahrir to Islamic politicians Mohammad Natsir and Hamka. Using martial law powers, the government closed-down newspapers who were critical of Sukarno's policies. 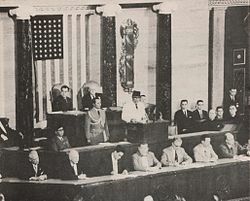 Sukarno addresses the U.S. Congress on 17 May 1956. Sitting behind him the U.S. Vice President/Senate President Richard Nixon and U.S. House Speaker Sam Rayburn. Sukarno was feted during his visit to the United States in 1956, where he addressed a joint session of the United States Congress. So far it is the only time any Indonesian President has addressed a joint session of the U.S. Congress. Soon after his first visit to America, Sukarno visited the Soviet Union, where he received more lavish welcome. Soviet Premier Nikita Khrushchev paid a return visit to Jakarta and Bali in 1960, where he awarded Sukarno with the Lenin Peace Prize. To make amends for CIA involvement in the PRRI-Permesta rebellion, U.S. President Kennedy invited Sukarno to Washington, D.C. and provided Indonesia with billions of dollars in civilian and military aid. To follow up on the successful 1955 Bandung Conference, Sukarno attempted to forge a new alliance called the "New Emerging Forces" (NEFO), as a counter to the Western superpowers dubbed the "Old Established Forces" (OLDEFO), whom he accused of spreading "Neo-Colonialism and Imperialism" (NEKOLIM). In 1961, Sukarno established another political alliance, called the Non-Aligned Movement (NAM, in Indonesia known as Gerakan Non-Blok, GNB) with Egypt's President Gamal Abdel Nasser, India's Prime Minister Pandit Jawaharlal Nehru, Yugoslavia's President Josip Broz Tito, and Ghana's President Kwame Nkrumah, in an action called The Initiative of Five (Sukarno, Nkrumah, Nasser, Tito, and Nehru). NAM was intended to provide political unity and influence for nations who wished to maintain independence from the American and Soviet superpower blocs, which were engaged in Cold War competition. Sukarno is still fondly remembered for his role in promoting the influence of newly independent countries. His name is used as a street name in Cairo, Egypt and Rabat, Morocco, and as a major square in Peshawar, Pakistan. In 1956, the University of Belgrade awarded him an honorary doctorate. 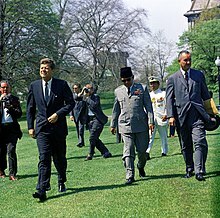 Sukarno with JFK and LBJ in 1961. In 1960 Sukarno began an aggressive foreign policy to secure Indonesian territorial claims. 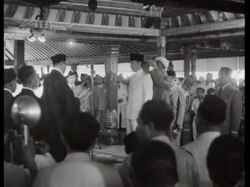 In August of that year, Sukarno broke off diplomatic relations with the Netherlands over the continuing failure to commence talks on the future of Netherlands New Guinea, as was agreed at the Dutch-Indonesian Round Table Conference of 1949. In April 1961 the Dutch announced the formation of a Nieuw Guinea Raad, with the intention of creating an independent Papuan state. Sukarno declared a state of military confrontation in his Tri Komando Rakjat (TRIKORA) speech in Yogyakarta, on 19 December 1961. He then directed military incursions into the half-island, which he referred to as West Irian. By end of 1962 3,000 Indonesian soldiers were present throughout West Irian/West Papua. Tensions between the military and communists increased in April 1965, when PKI chairman Aidit called for the formation of a "fifth armed force" consisting of armed peasants and labor. Sukarno approved this idea and publicly called for the immediate formation of such a force on 17 May 1965. However, this idea was rejected by Army Chief Ahmad Yani and Defence Minister Nasution, as this was tantamount to allowing the PKI to establish its own armed forces. Soon after this rejection, on 29 May, the "Gilchrist Letter" appeared. The letter was supposedly written by the British ambassador Andrew Gilchrist to the Foreign Office in London, mentioning a joint American and British attempt on subversion in Indonesia with the help of "local army friends". This letter, produced by Subandrio, aroused Sukarno's fear of a military plot to overthrow him, a fear which he mentioned repeatedly during the next few months. The Czechoslovakian agent Ladislav Bittman who defected in 1968 claimed that his agency (StB) forged the letter on request from PKI via Soviet Union, to smear anti-communist generals. On his independence day speech of 17 August 1965, Sukarno declared his intention to commit Indonesia to an anti-imperialist alliance with China and other communist regimes, and warned the Army not to interfere. He also stated his support for the establishment of a "fifth force" of armed peasants and labor. While Sukarno devoted his energy to domestic and international politics, the economy of Indonesia was neglected and deteriorated rapidly. The government printed money to finance its military expenditures, resulting in hyperinflation exceeding 600% per annum in 1964–1965. Smuggling and the collapse of export plantation sectors deprived the government of much-needed foreign exchange income. Consequently, the government was unable to service massive foreign debts it had accumulated from both Western and Communist bloc countries. Most of the government budget was spent on the military, resulting in deterioration of infrastructure such as roads, railways, ports, and other public facilities. Deteriorating transportation infrastructure and poor harvests caused food shortages in many places. The small industrial sector languished and only produced at 20% capacity due to lack of investment. Sukarno himself was contemptuous of macroeconomics, and was unable and unwilling to provide practical solutions to the poor economic condition of the country. Instead, he produced more ideological conceptions such as Trisakti: political sovereignty, economic self-sufficiency, and cultural independence. He advocated Indonesians to be "standing on their own feet" (Berdikari) and reach economic self-sufficiency, free from foreign influence. Towards the end of his rule, Sukarno's lack of interest in economics created a distance between himself and the Indonesian people, who were suffering economically. His face had become bloated by disease, and his flamboyance and sexual conquests – which had once endeared him to the people – caused public criticism and turned support towards the army. On the dawn of 1 October 1965, six of Indonesia's most senior army generals were kidnapped and murdered by a movement calling themselves the "30 September Movement" (G30S). Among those killed was Ahmad Yani, while Nasution narrowly escaped, but the movement kidnapped First Lieutenant Pierre Tendean, his military aide; presumably mistaking him for General Nasution in the darkness. The G30S Movement consisted of members of the Presidential Guards, Brawidjaja Division, and Diponegoro Division, under the command of a Lieutenant-Colonel Untung bin Sjamsuri. The movement took control of the radio station and the Merdeka Square. They broadcast a statement declaring the kidnappings were meant to protect Sukarno from a coup attempt by CIA-influenced generals. Later, it broadcast news of the disbandment of Sukarno's cabinet, to be replaced by a "Revolutionary Council". In Central Java, soldiers associated with the Movement also seized control of Yogyakarta and Solo on 1–2 October, killing two colonels in the process. Indonesian actor Ario Bayu portrayed Sukarno in the 2013 movie Soekarno: Indonesia Merdeka directed by Hanung Bramantyo, about his life from birth until Indonesian independence from Japanese occupation. ^ Also written as Soekarno. ^ A. Setiadi (2013), Soekarno Bapak Bangsa, Yogyakarta: Palapa, pp.21. ^ "Sukarno". Random House Webster's Unabridged Dictionary. ^ Sukarno; Adams, Cindy (1965). Sukarno: An Autobiography. Bobbs-Merrill. p. 27. ^ Bung is an Indonesian language term of endearment analogous to "older brother", Pak is used more formally as "sir" or "father". ^ "Biografi Presiden Soekarno" (in Indonesian). Biografi Tokoh. ^ Mrazek, Rudolf (2002). Engineers of Happy Land: Technology and Nationalism in a Colony. Princeton University Press. pp. 60–1, 123, 125, 148, 156, 191. ISBN 0-691-09162-5. ; Kusno, Abidin (2000). Behind the Postcolonial: Architecture, Urban Space and Political Cultures. Routledge. ISBN 0-415-23615-0. ^ Sukarno; Adams, Cindy (1965). Sukarno: An Autobiography. Bobbs-Merrill. p. 92. ; Legge, John David. Sukarno: A Political Biography. Singapore: Archipelago Press. pp. 101–102. ISBN 978-981-4068-64-2. ^ Friend, Theodore (2003). Indonesian Destinies. The Belknap Press of Harvard University Press. p. 27. ISBN 0-674-01834-6. ^ Friend, Theodore (1988). The Blue-Eyed Enemy: Japan Against the West in Java and Luzon 1942–1945. Princeton University Press. pp. 82–84. ISBN 0-691-05524-6. ^ "Bung Karno dan Lembar Hitam Romusha " ROSO DARAS". Rosodaras.wordpress.com. Retrieved 14 February 2011. ^ Sukarno (1965). Sukarno: An Autobiography. Bobbs-Merrill. p. 192. cited in Friend, Theodore (2003). Indonesian Destinies. The Belknap Press of Harvard University Press. p. 29. ISBN 0-674-01834-6. ; Adams, Cindy (1967). My Friend the Dictator. Bobbs-Merrill. pp. 184–186. ^ Mulyawan Karim (18 August 2009). "Misteri Pembongkaran Gedung Proklamasi / Mistery of Bemolishing Proclamation Building". KOMPAS daily: 27. ^ "Sejarah Indonesia". Gimonca.com. Retrieved 14 February 2011. ^ Kinzer, Stephen (2013). The Brothers: John Foster Dulles, Allen Dulles, and Their Secret World War. New York: Times Books. p. 203. ^ Goldstein, Robert Justin (2001). Political Censorship. Taylor & Francis. ISBN 9781579583200. ^ Anwar, Rosihan (2006). Sukarno, tentara, PKI: segitiga kekuasaan sebelum prahara politik, 1961–1965 (in Indonesian). Yayasan Obor Indonesia. ISBN 9789794616130. ^ Hunter, Helen-Louise (2007). Sukarno and the Indonesian Coup: The Untold Story. Greenwood Publishing Group. ISBN 9780275974381. ^ a b "Chapter 1: January 1961–Winter 1962: Out from Inheritance". Aga.nvg.org. Archived from the original on 19 July 2002. Retrieved 14 February 2011. ^ "GANEFO & CONEFO Lembaran Sejarah yang Terlupakan". JakartaGreater. 25 October 2015. Retrieved 18 May 2017. ^ "Djago, the Rooster". TIME. 10 March 1958. Retrieved 20 April 2009. ^ Mydans, Seth (17 February 1998). "Jakarta Journal; Weighty Past Pins the Wings of a Social Butterfly". The New York Times. Retrieved 20 April 2009.